SAN FRANCISCO — The Asian Art Museum announced Sept. 30 the election of Bay Area philanthropist and art collector Akiko Yamazaki as chair of the Asian Art Commission and Asian Art Museum Foundation, the dual governing boards responsible for the administration of the Asian Art Museum-Chong-Moon Lee Center for Asian Art and Culture. A public/private partnership, the museum is one of San Francisco’s premier arts institutions and home to a world-renowned collection of more than 18,000 Asian art treasures spanning 6,000 years. Yamazaki succeeds Anthony Sun, who served two consecutive two-year terms as chair. Yamazaki, who most recently served as vice chair of the commission and president of the foundation, will serve as chair for two years, guiding the museum and its boards in fulfilling the museum’s mission: To lead a diverse global audience in discovering the unique material, aesthetic and intellectual achievements of Asian art and culture. As the museum enters a second decade in its Civic Center location, and approaches its 50th anniversary as an institution in 2016, Yamazaki’s priority is transforming the museum’s visitor experience to engage a broad, diverse audience while building financial sustainability and growth. Yamazaki will also shepherd the museum’s leadership in fulfilling the publicly mandated responsibility of safely housing, protecting, and presenting the museum’s collection and exhibitions. Working with the board and museum staff, she will lead local, national and international efforts to cultivate deeper philanthropic support for the museum’s programs, activities and growth. During her four years as a commissioner (governing the city’s collection of Asian art held by the museum) and 15 years as a trustee of the foundation (private fundraising arm of the museum), Yamazaki spearheaded and co-chaired the board committees responsible for developing the museum’s strategic plan and priorities in 2007, and its subsequent long-range business plan in 2013. She also championed the creation and launch of the museum’s new brand in 2011. “We serve at a unique moment in time. 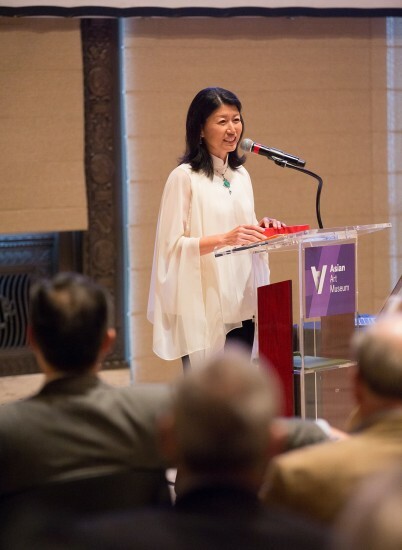 As Asia’s world influence grows, the Asian Art Museum is uniquely positioned to facilitate international learning, cultural understanding and artistic appreciation of this vast and diverse region that represents more than half the world’s population,” says Yamazaki. Yamazaki and her husband, Bay Area entrepreneur Jerry Yang, are longtime supporters of the museum and significant collectors of Chinese calligraphy and contemporary Chinese ink artworks. Yamazaki and Yang are active supporters of Bay Area-based non-profit organizations, including Stanford University, their alma mater, and Wildlife Conservation Network, among others. Since its 2003 move from Golden Gate Park to the Civic Center, the museum has welcomed more than 3 million visitors, including more than 215,000 school students. Through rich art experiences, centered on historic and contemporary artworks, the museum unlocks the past for visitors, bringing it to life, while serving as a catalyst for new art, new creativity, and new thinking. The museum’s home is an architectural gem featuring a dynamic blend of beaux arts and modern design elements. The building is the result of a dramatic $170 million transformation of San Francisco’s former main public library in 2003 by noted Italian architect Gae Aulenti. Information: (415) 581-3500 or www.asianart.org. Location: 200 Larkin St., San Francisco.